The primary reason a Christian College exists is to give an educational foundation to students for ministry in both professional and volunteer capacities. The division of Christian ministries is maintained to educate individuals for those tasks. 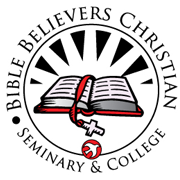 The Bible is the center of education in a Christian college. The entire curriculum is to be Bible-centered. It is our conviction that a person is not genuinely educated until he/she has at least a basic knowledge of Scripture. This conviction lies in our confidence that the Bible is the very word of God, and with divine authority and absolute certainty, it speaks about the nature of humanity and the universe, and about the meaning of human history and life. The education received by students in this degree program will give them an educational foundation to enter the ministry of their calling or graduate studies, should they so desire.